We were doing three person crews generally with the buoys laid out earlier than the 10AM start and the committee boat standing by. First call was there was too much wind for Spinnakers (gusts probably to 25 maybe 30 knots I dunno). I was on the Main Sheet, so was in the very small cockpit between the helmsman and Kirk working the jib. Kirk then jumped (literally) to the committee boat to assist getting Bernie to the hospital — leaving just the two of us. And as two we won the first two. The jib was very unlike the bigger boats as you’re really releasing with one hand and trimming with the other — hopefully at the same time. There’s kind of an art to this while ducking under the boom. Good bit of water coming over the bow as well. And loud (wind). In good wind the boat comes about quickly and heels so the rail is in green water before you know it. In wind. All good — nothing like a few hours in the wind to make you forget anything else but wind and water. I don’t even really know where this nautical fascination came from — think it’s all part of a general wanderlust. Is perfect for now. The boats are courtesy of Oak Cliff Yacht Club (more on Oak Cliff here: http://very.fm/little-rainlittle-fog). 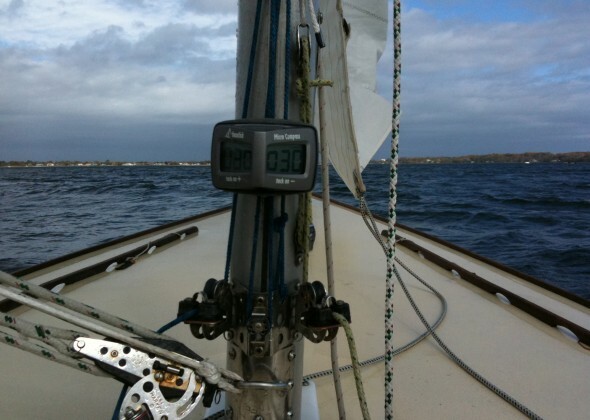 This entry was posted by John Pasmore on Sunday, November 1st, 2009 at 9:57 pm	and is filed under New York, Outdoor and tagged with Oyster Bay, Sailing, Shields 30, The Oak Cliff Yacht Club. You can follow any responses to this entry through the RSS 2.0 feed.